What? 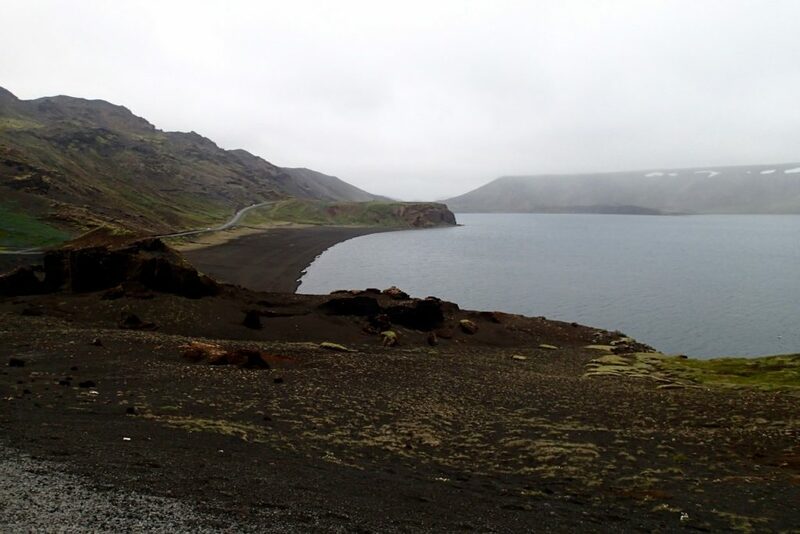 Hafnarfjörður … that’s Icelandic for “harbor fjord” and Iceland’s third largest city with 27,000 inhabitants! It’s the place where I got on my bicycle 4 weeks ago, butterflies tickling my stumac. That’s where I arrived two days ago to complete my one month in Iceland by writing a blogpost and organizing my stuff for the flight to Alaska. I cycled a lot, these 4 weeks. Only three times my tent was in the same spot for two nights in a row. 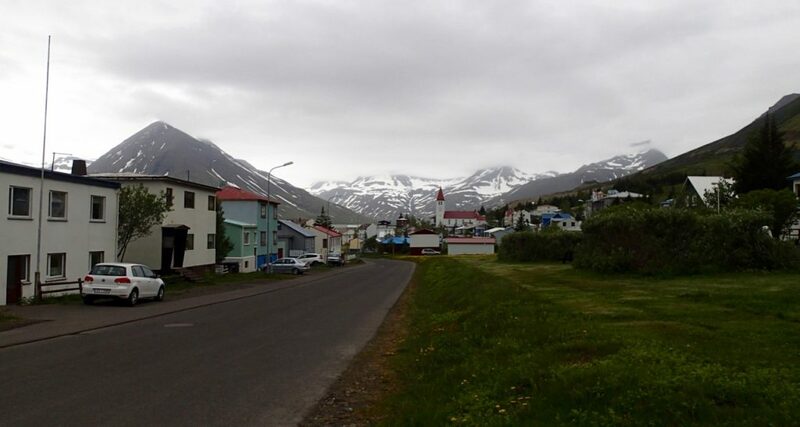 After the west fjords I finally get to see some more Icelandic villages. These purple lupines are everywhere. They smell delicious! 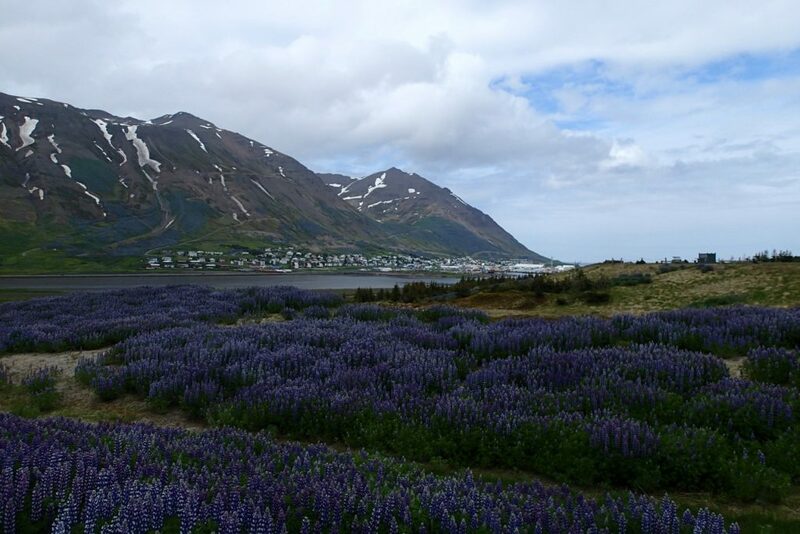 After the west fjords I cycled along the coast to ‘universitytown’ (17.797 inhabitants) Akureyri. 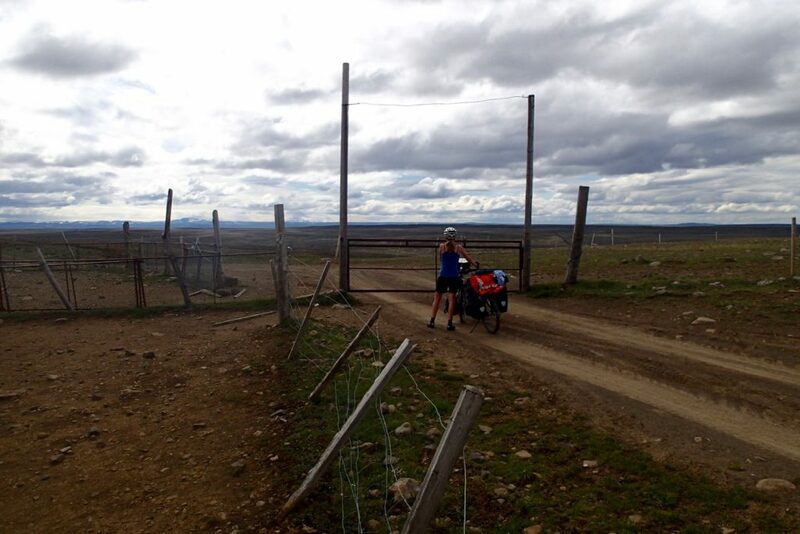 I hoped that, after cycling a 300km ‘loop’, the road through the interior would be open. In Akureyri I heard to good news! The Kjölur, or F35, got reopened. Akureyri as a destination was kind of a disillusion, but at least I could stock up on food in budgetsupermarket BÒNUS. Heading back west on road 1 I crossed beautiful landscapes! 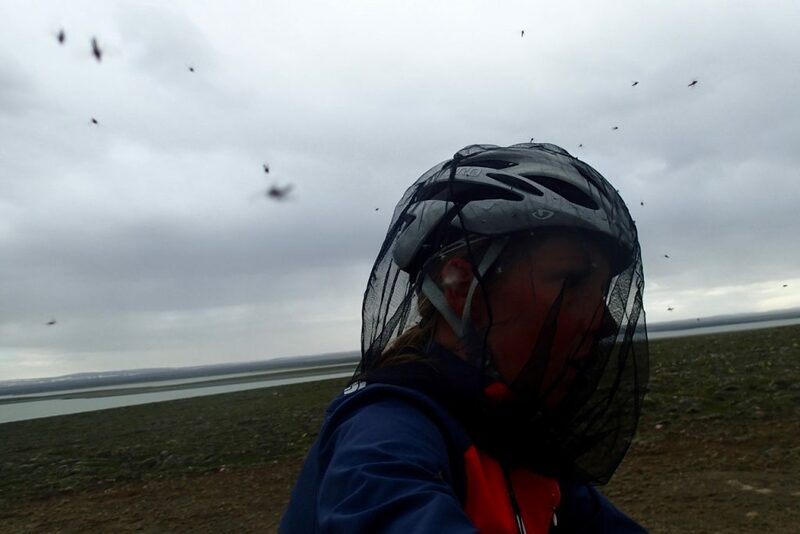 I fancied myself in Kyrgyzstan while cycling along a green fringed river in between brown mountains with a patch of snow here and there. A feeling of nostalgia surprised me. Central Asia touched me in a way not many places did. 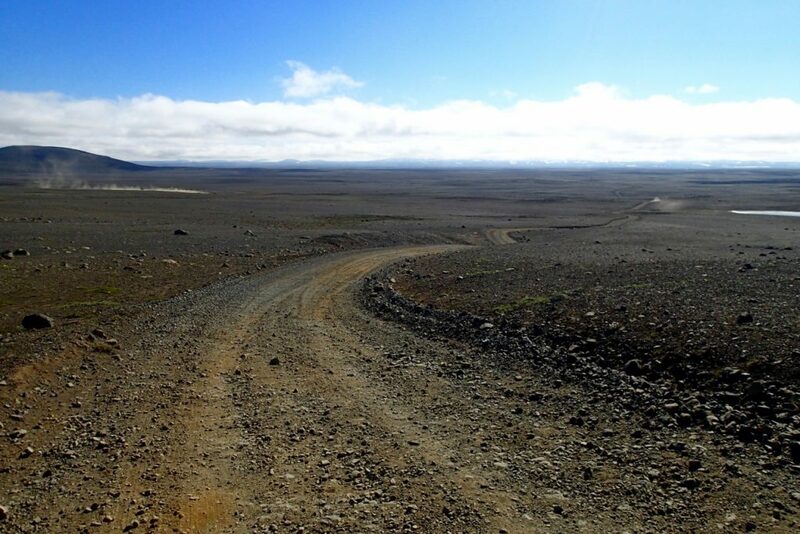 ‘Why do it the easy way if you can do it the hard way’ I must’ve thought while in Varmahlíð. And so I decided to take a ‘shortcut’ over a tiny road towards the F35 I so longed for, instead of following road 1 till the turn to the Kjölur. From the moment I left the village it was absolutely quiet. That full day I only saw 4 vehicles. So peaceful, so spacious, so rugged. I slowly bounced over the rocks scattered in loose sand that made the road while climbing to 620m. The ‘top’ was nicely marked with a gate. Behind it the interior stretched out as far as my eye could see. I don’t need forests, waterfalls or exuberant ‘flora and fauna’ in order to enjoy nature. Give me endless plains with a distant mountaintop or the promise of a lake, and I’m in my element. At the end of day 1 in the interior a very strong east wind picked up. That wind would keep blowing all night and still be there the next day to torment me with all it’s might. Right from the side. 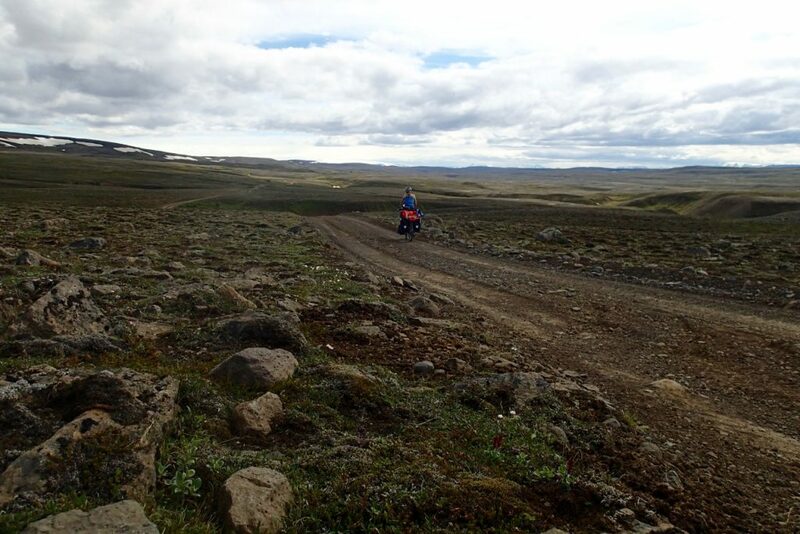 It made it impossible for me to move more than 6 or 8 meters before being forced to get off the bike and drag it out of the deep gravel on the side of the ‘road’. 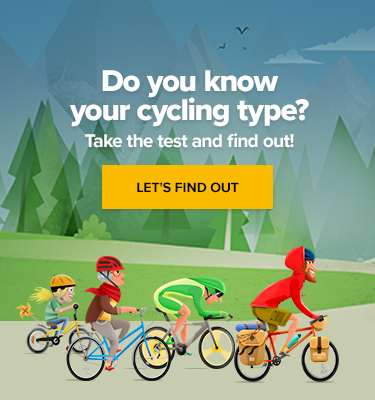 Often I nearly crashed, my back wheel slipping over the big rocks that I impossibly could avoid. 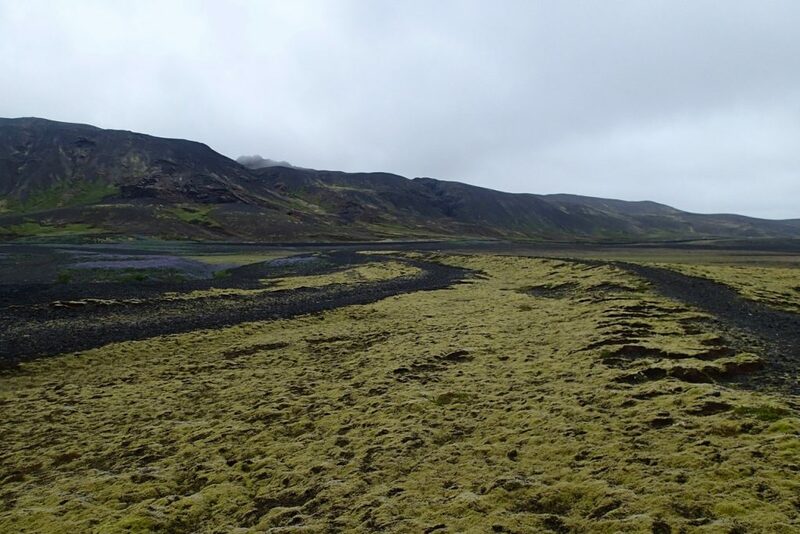 Halfway the stretched out and dry interior you find Hveravellir. 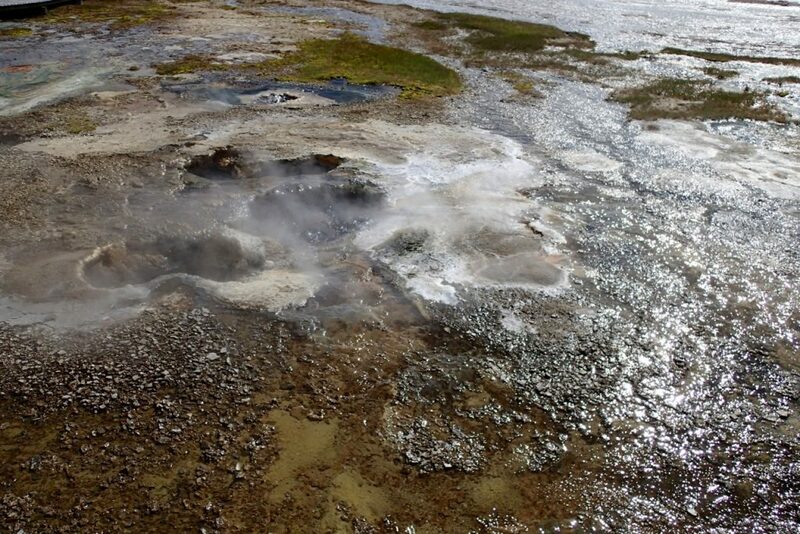 A geothermal area with hotsprings. After two days of ‘suffering’ I treated myself on a day off at the campsite in this luscious green surrounding and, of course, in the hotpot! 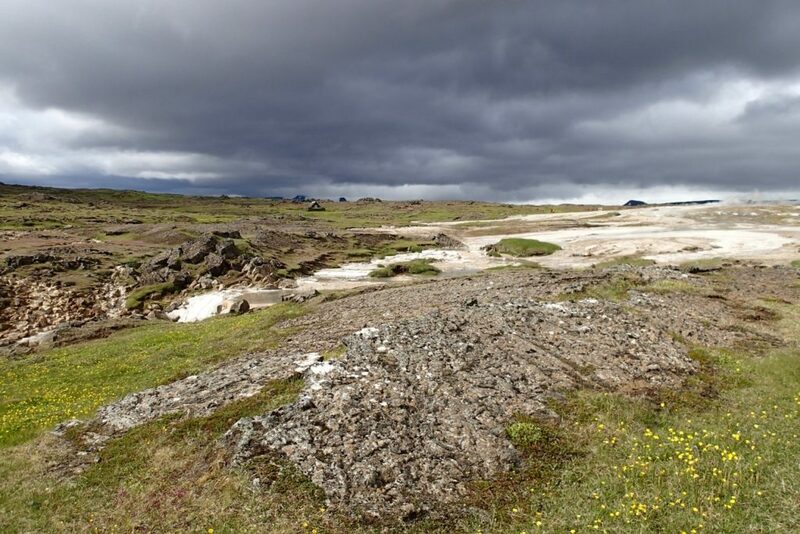 In the 18th century the IJslandic outlow Fjalla-Eyvindur used the hotsprings to cook stolen sheep. Never-ending watercooker. Whistling and steaming. The first building I saw was the ‘visitorscentre’ of a waterfall named Gulfoss. A full parking lot next to it. 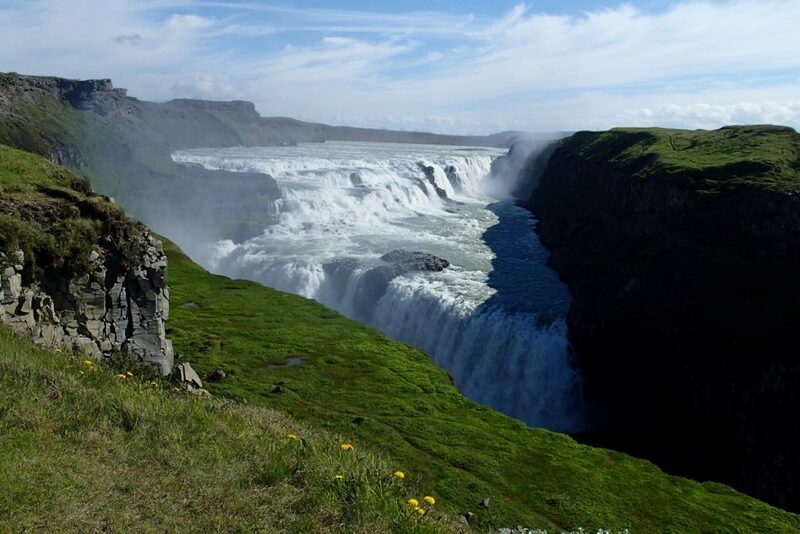 Gulfoss is part of the ‘Golden Circle’; three touristic highlights in the south of Iceland you have to ‘do’. For the majority of the tourists this (and Reykjavik), is their main reason to visit Iceland and pretty much all they’ll see of the island. Looking through my eyelashes in the visitorscentre I fancied myself in China. 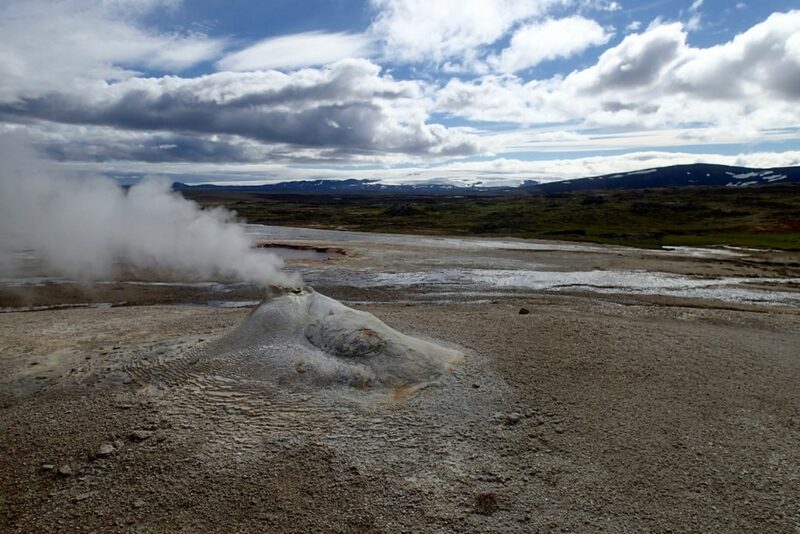 9km down the road you find Geysir, a geothermal area with the active geyser Strokkur that erupts every 4 to 8 minutes. Together with the other tourists I watched from behind a line how the hot water, out of nothing, blew 30 meters up in the air. I didn’t complete the ‘Golden Circle’ by visiting National Park Thingvellir, but continued my way south. Some friends I texted about my visit to these ‘highlights’ replied excited. ‘SO?? What did you think of it?’, ‘Impressive, right?’, ‘Wow, I’d love to see that!’. It made me wonder. Why doesn’t this enormous waterfall Gulfoss touch me? I’ve seen over a hundered waterfalls here on Iceland, but none of them compare to Gulfoss in size and power. This isn’t new to me. It’s been the same on all of my travels. Is there some beautiful nature to see? Write about it in Lonely Planet, print a flyer, put a fence around it and signpost the route, start a touristic shuttlebusservice to it… and it won’t touch me anymore. Either combination of just two of the given will be sufficient. You’d think that it has something to do with my opinion about it. That it wouldn’t be as special. That it has to be pristine. 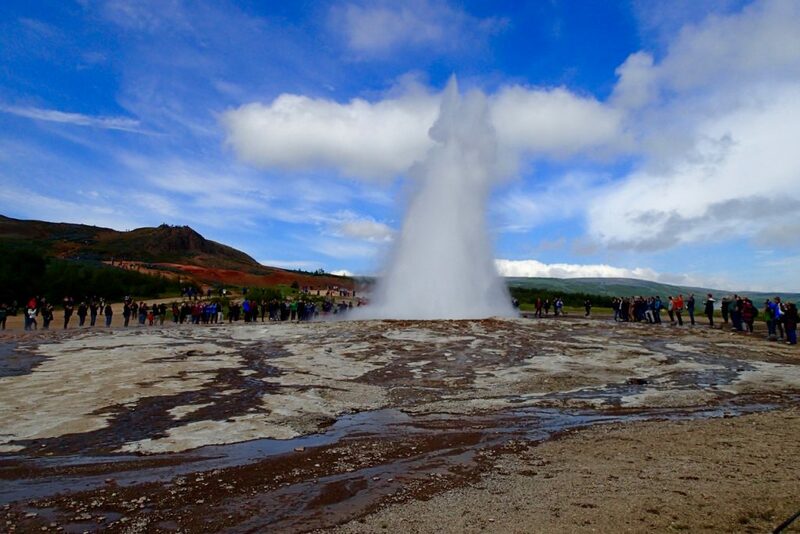 Or that I judge the tourists who ‘do’ the Golden Circle in half a day on a organized tour. Even when the umpteenth bus of Chinese, armed with mouth masks, jungle hats, cameras and selfiesticks, arrives, I don’t feel irritations or judgement welling up in my geyser. The higher the fence around the sight and the more signposts marking te way, the more difficult it finds its way to my heart. I can find it special, interesting, impressive or even beautiful… but it doesn’t touch me. Something to chew on for a while, until I reach the right analysis. 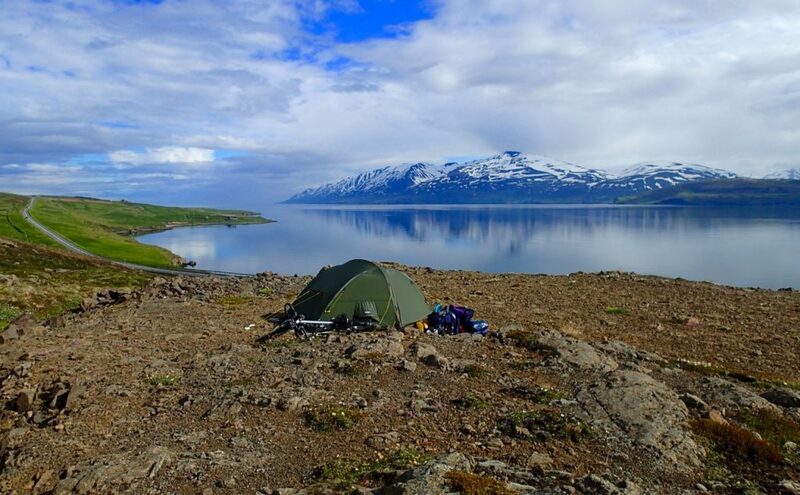 Almost at the end of my trip here on Iceland I pitched my tent in the rain behind a shed, sheltered from the wind, with the permission of a present farmer. Just when I started cooking a woman came by to invite me to her home to have a shower and spend the night. I hesitated.. I just put up my tent…. Though, when I got inside to ‘just have a shower’ the bed was very tempting and I decided to spend the night. The next morning, we had breakfast together and went on a little roadtrip. We visited a flowervillage and drove along the coast in the campervan with my bike attached on the back. 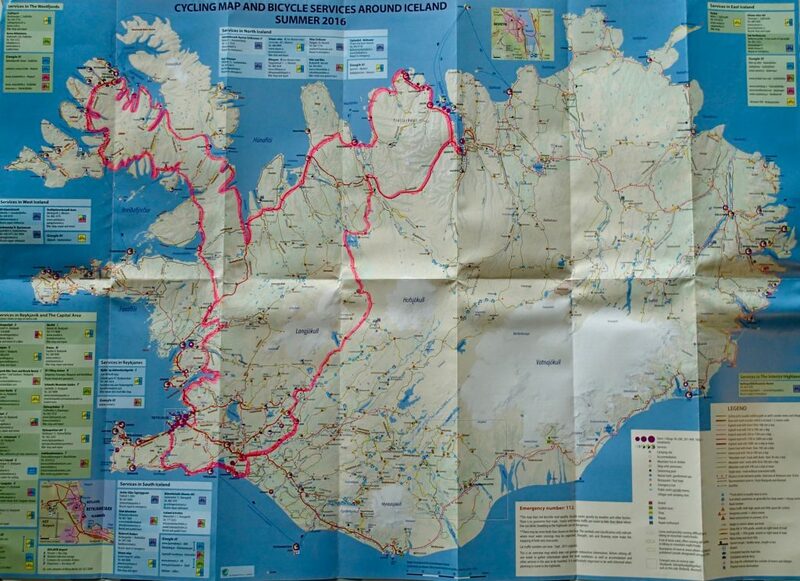 Once they dropped me and we said goodbye, I only had a short but beautiful ride left to Hafnarfjörður. 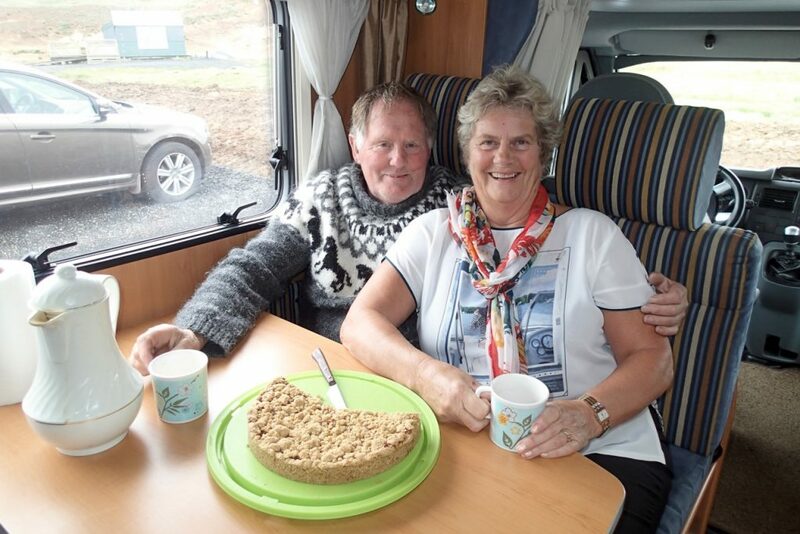 How nice to be a guest with an Icelandic couple, just before the end of my time here. It felt warm like ‘Ukrainian hospitality’ to me.. (for those who’ve read my blogs from back then). Dòra and her husband who took me on a road trip. Great pie!! So here I am, looking back on one month in Iceland. What I think about this country? It’s a beautiful country. The nature is diverse and often fairylike. Peace, space, ruggedness are to be found around every corner. I’m very glad I went here! Still, something inside me balks. This was indeed a beautiful country to see. But I feel a very clear difference with the countries that we beautiful to be. Being here and experiencing that difference makes it even clearer in which countries I left a piece of myself and at that the same time found their way into my heart. And that’s how I learn while on the road. About the world and about myself. So come on Alaska! I’m ready for you! Adrenaline Filled Fun in Alaska: Feel Like Racing a Kodiak Bear?